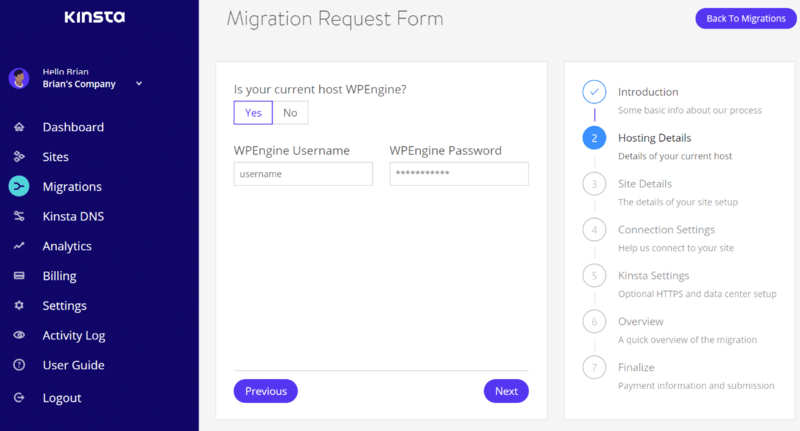 From requesting a site migration, purchasing additional migrations, and bulk pricing; below is everything you’ll need to know regarding how WordPress migrations work at Kinsta. Our Starter plan only includes free migrations if you pay annually. You have sensitive data you don’t want to disclose. You want to migrate immediately rather than coordinating with us. Important: Migrating larger and complex sites yourself can easily result in data loss or fail entirely if you don’t know what you’re doing. It’s much safer to let our expert migration team take care of everything for you. 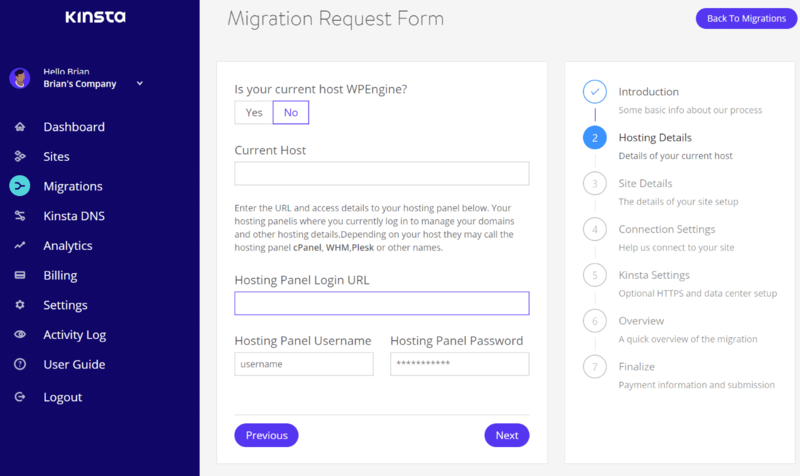 Moving your site to Kinsta usually won’t incur any downtime and we’ll help you inspect your migrated site prior to going live. 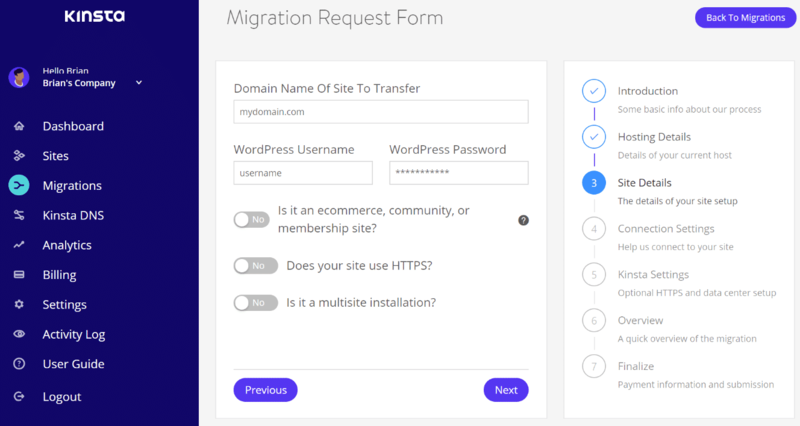 To start a migration from within your MyKinsta dashboard simply launch “Migrations” on the left-hand side and click on “Request Migration.” You’ll see the number of free migrations your plan includes, how many you’ve used up and have left. To perform the transfer we ask for a number of passwords. We value and guard your privacy. This form is highly secured over SSL, once we’ve finalized the transfer we destroy all passwords we receive. We never modify your original website during migration. It will continue to work as usual during and after the migration. We always notify you whenever a migration is started and when it ends. Simply click “Next” to get started. Typically your FTP, SFTP, and SSH connection information can be found in your current hosting provider’s control panel. 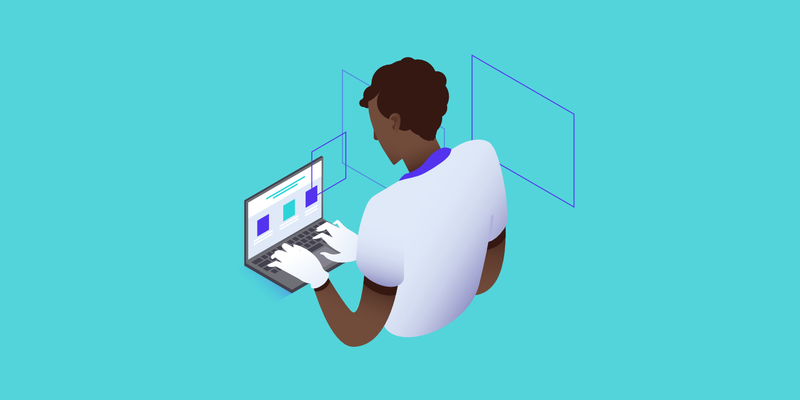 If you’re unsure of these details, reach out to your current host or ask a member of the Kinsta support team for help. If you’re using cPanel for example, your username and hosting server details are listed in your User Area → My Accounts → Information & Settings page. FTP account information can also be found under Files → FTP Accounts. 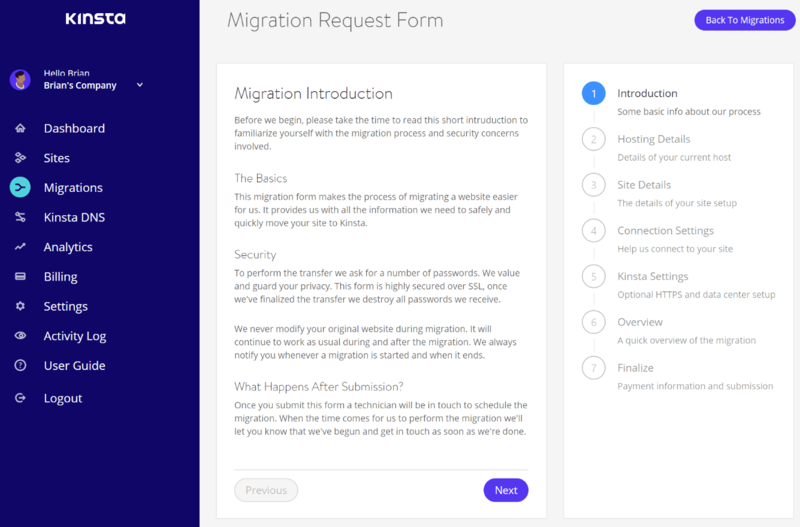 After submitting the Migration Form, one of our support team members will get in touch with you to schedule the migration. Your pending migrations will then show up under “Migrations” in which you can check the status anytime. You will also be continuously updated on the status by our team. 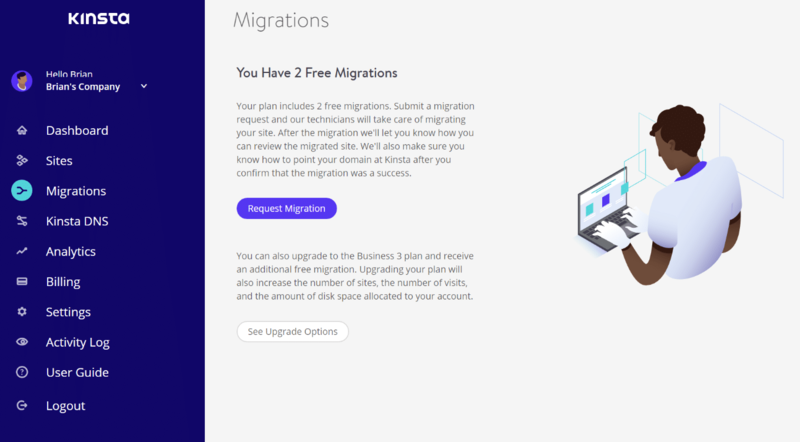 Note that migrations are only free if your account is open for at least 30 days. If you cancel your subscription earlier the migration will be charged at the regular price of $100. 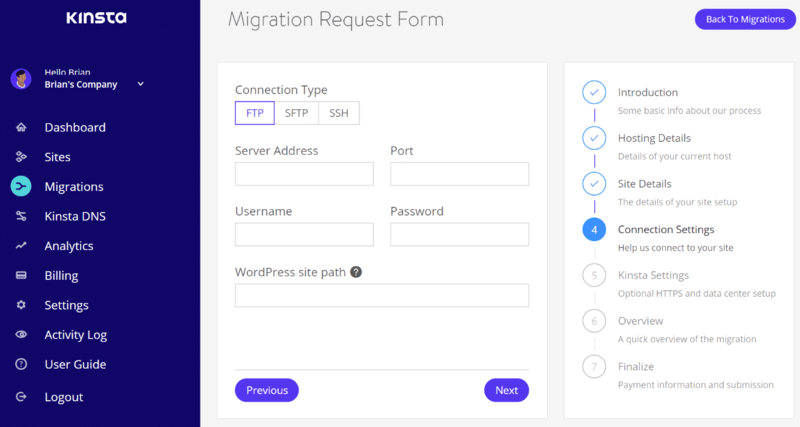 Once you reach the number of free migrations included in your plan, you can still request site migrations from our team for a fixed fee of $100. We may not be able to migrate highly-customized WordPress installations where the WordPress Core files and directory structure have been customized. Occasionally we will migrate a site that makes heavy use of .htaccess to set up complex redirections and URI masking rules. While our team is happy to set up simple redirections, if your site’s .htaccess file includes complex rules, you will need to work with a developer to convert these into Nginx format and then supply the converted rules to our team to add to the Nginx configuration. Setting up DNS and configuring third-party services is not included in our migration service and you will need to handle these tasks. 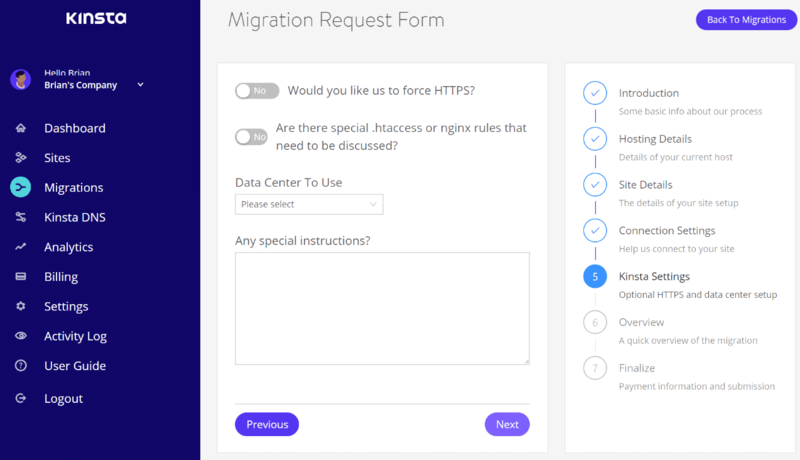 A few common examples of tasks that clients will need to take care of include migrating DNS records to Kinsta DNS, setting up Cloudflare or Sucuri, updating the A record or nameservers at your domain name registrar, and setting up email service. In some cases, a client may have us migrate their site but not be able to go live in a timely manner. When the client is ready to go live with the site on our servers they may need to have the content of the site updated to reflect changes made to the site while it’s been live and hosted elsewhere. Check out details regarding requesting a second migration.